The greenhouse effect occurs when certain gases in the Earth's atmosphere (the air around the Earth) traps infrared radiation. This makes the planet become warmer, similar to the way it makes a greenhouse become warmer. 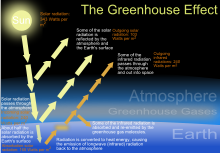 The greenhouse effect is caused by greenhouse gases; the most important greenhouse gases in Earth's atmosphere are: water vapor, carbon dioxide, and methane. When there is more greenhouse gas in the air, the air holds more heat. This is why more greenhouse gases cause climate change. The greenhouse effect is natural. It is important for life on Earth. Without the greenhouse effect, the Earth's average temperature would be around -18 or -19 degrees Celsius (0 or 1 degree Fahrenheit). Earth would be locked in an ice age. Because of the greenhouse effect, the Earth's actual average temperature is 14 degrees Celsius (57 degrees Fahrenheit). The problem is that recently, the greenhouse effect has become stronger. This is because humans have been using large amounts of fossil fuels, which release carbon dioxide when they are burned. Since carbon dioxide is a greenhouse gas, it has caused the planet to warm over the past 150 years. About 10,000 years ago, before people started burning large amounts of fossil fuels, there was 260 to 280 parts per million (ppm) of carbon dioxide (CO2) in the atmosphere, but now there is over 400 ppm. Most scientists say that having 350 ppm or less is safe for the environment and that species on the planet can adapt to this level. Higher levels can make severe problems for animal and marine life that are already being seen today, such as ocean acidification. The greenhouse effect was first proposed by Joseph Fourier in 1824. Mars, Venus and other planets with atmospheres also have greenhouse effects. The effect on Venus is especially strong because Venus has so much CO2. This is why Venus is hotter than Mercury, even though Mercury is closer to the sun. The first person to predict that carbon dioxide from the burning of fossil fuels (and other combustion processes) could cause global warming was Svante Arrhenius. This page was last changed on 21 March 2019, at 09:23.